In 1887, a young woman named Helen Milman, living at Tenby in Pembrokeshire, set up a scheme where local school-children pledged themselves to perform some work for the Society for 15 minutes each day or for an hour-and-a-half a week. She garnered the interest of the Earl and Countess of Pembroke in the project, which had evolved into the idea of a 'Holiday Union' — a more intensive period of work during the school holidays. Inspired by the recent opening of the Society's St Nicholas' Home at Upper Tooting — its first for children with physical disabilities, what were then usually referred to as 'cripples' — Miss Milman proposed that the Holiday Union aim to raise the fifteen pounds or so required to support a child at the home for one year. The children made various and goods for sale and reached their target. The scheme spread rapidly and by July 1889 had become known as the Children's Union. In 1892, the Children's Union raised £379, which covered the entire running costs of the Tooting home. In 1893, the St Nicholas Home moved to larger premises at West Byfleet, near Weybridge. In the same year, the Children's Union, which now had almost four thousand members, raised over a thousand pounds. A Northern Children's Union was formed in 1897, supporting the work of the Bradstock Lockett Home at Southport, while the Manchester and Blackburn Diocesan Union raised funds for the St Chad's Home in Headingley, Leeds. The Union's efforts later centred on Pyrford where new purpose-built premises were opened for the St Nicholas home in 1908. The St Martin's Home, previously based at Sutton, moved to an adjoining site at Pyrford in 1916. 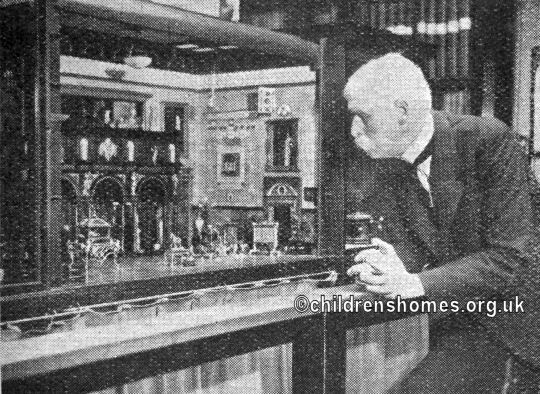 The Children's Union received a major boost to its funds in the late 1920s when the architect Sir Neville Wilkinson completed twenty years' work on building a highly detailed model mansion called Titania's Palace. The model was put on show and also toured America, where it made the sum of £3,500. The money was handed over to the Union and, together with other donations, funded the provision of an operating theatre at Pyrford. In later years, reflecting changes in the Society as a whole, the focus of the Union's support moved from physically disabled children towards babies and toddlers. By 1950, all the various provinces and branches of the Union had amalgamated. By 1979, following administrative changes within the Society, the Children's Union effectively ceased to exist. Its work was continued by the Society’s Youth Department.